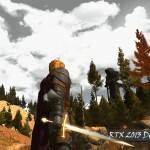 So they have released another video for SOTA, it is the Shroud of the Avatar 6 Month Video. The last one was at the 3 month point of development and you can watch the first one by clicking here. In this new video there has been A LOT of changes in the last 3 months. Since the 3 month point they have implemented: many more scenes, cleaned up the graphics, added spells, created more crafting, designed more homes, and much more! In the video below they give you a very detailed look at the progress they have made on the game in just 6 months! The graphics are coming along nicely, but as they state in the video it has only been 6 months and they will improve A LOT more before the closed Beta release. The video is definitely worth a look, as it shows how some of the villages will be designed, including how house plots will appear and even give you a walk through in many of the houses that will be available to the players at release! The Video has made me very excited for the Beta release next year, and so far I am VERY impressed with just how detailed the game is already in 6 months knowing there is still a year of work to go before the Beta product is ready. If anyone is still interested in joining the Beta next year after watching this video, you can do so by clicking here. Well without making you wait longer, here is the 6 month progress video. Enjoy!